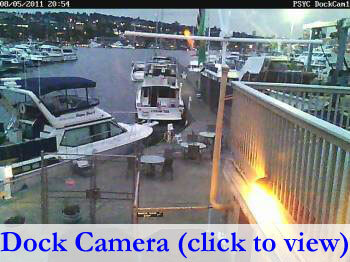 Welcome to the Puget Sound Yacht Club Web Site! Puget Sound Yacht Club is actively recruiting new members! Click on Membership (above) to see why you should join! The Club is located in Seattle on the north shore of Lake Union near Gas Works Park overlooking the lake with a dock for visiting and reciprocal moorage. Puget Sound Yacht Club was founded in 1954 and has continued as a family oriented cruising club. The membership is made up of friendly informal individuals who value safe boating and wish to share their boating experiences with other boaters. The majority of boats in the Club are small to medium size power boats but there are a number of sail boats in the fleet and the Club welcomes new members with all types and sizes of water craft. If you are at all interested in one of the best boating values and fun on and around the water, please look over our site, visit the membership area, take a look at our cruise and social pictures and give our membership chairperson a call or send an email for more information. In addition to the main Clubhouse the Club has an outstation on Gedney (Hat) Island located six miles west of Everett. Current members please log in and you will be presented with an expanded menu of member resources and locations to visit as well as be able to up-date your account settings directly on line. Please report any problem or suggestions on how to improve your Club's web site to the web site manager. The Sound Waves menu is at the top under Welcome.